The eventual commercial rollout of geological storage of CO2 requires a thorough understanding of its underlying scientific processes. This project is partly funded by COAL21 and being delivered by the CO2CRC – Australia’s leading carbon capture and storage (CCS) research organisation – which is conducting large-scale, detailed research at its world-class Otway National Research Facility. The purpose of this research is to acquire a solid understanding of the science of geological storage, including how CO2 is trapped, how it migrates within a reservoir, how this migration can be monitored and develop predictive techniques for CO2 plume movement. The project engages a range of novel and adapted techniques to monitor CO2 as it migrates then settles in a geological rock formation. Through the injection of CO2, the team can verify that detailed modelling undertaken prior to injection accurately predicts how the CO2 will migrate and stabilise. Successful storage of 65,000 tonnes of CO2 in a depleted gas field – Australia’s largest storage demonstration and the world’s largest geosequestration research effort, and globally recognised for its excellence. Successful storage of 15,000 tonnes of CO2 in a saline aquifer without relying on a conventional overlying seal layer to trap the CO2 and prevent it escaping to adjacent rock layers (and eventually to the surface). The CO2 was instead successfully trapped in the pore spaces within the reservoir rock. This unconventional trapping will, if proven at scale and accepted as a trapping mechanism, greatly increase the estimated geological storage global capacity. Discovery that 5,000 tonnes of CO2 can be detected using seismic surveys (a common technology used by oil and gas producers). This is an important finding as geological storage of CO2 will require monitoring to verify that the CO2 plume remains in situ. 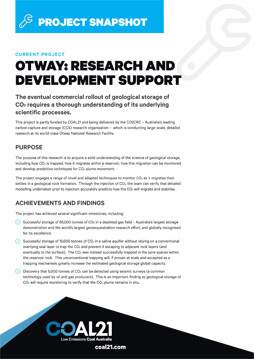 Planning for the Otway National Research Facility began in December 2005 with the establishment of an operating company and the securing of oil and gas tenements in preparation for CO2 injection trials. Otway operates as a large-scale geological storage and capture research facility, involving collaboration between Australian and overseas researchers. 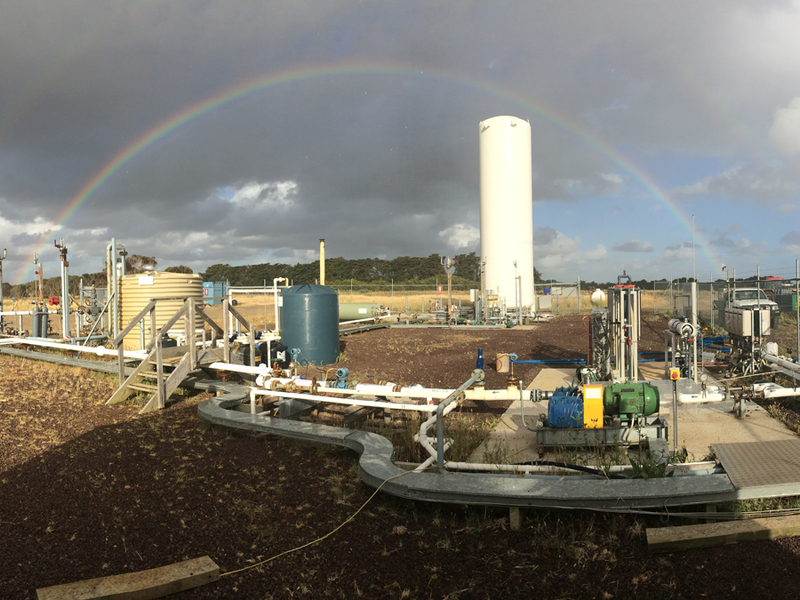 CO2CRC is planning a larger scale experiment at the Otway site, involving up to 40,000 tonnes of CO2 injected into a saline formation. This experiment will also test novel subsurface monitoring techniques, potentially offering lower cost alternatives to today’s technologies.